Trevor is on a great adventure right now. 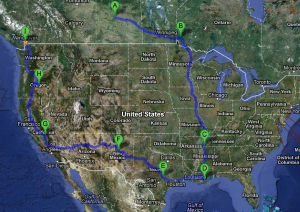 He's making a trek from Canada all through the United States on an epic 5 week roadtrip. How awesome does that sound? One of his first stops will be at Voodoo Jam, so if you see a guy down by the river, riding flatland, there's a good chance it's him and he'll be worth meeting. You can catch updates from his incredible trip here (http://thegoldfivan.tumblr.com/), and I highly recommend doing that! In the meantime, check out this tidy video of him, his van, and some riding.